Beyond Skyrim: Bruma's weapons and armor become unique to Cyrodiil. Craft Skyrim style in Skyrim and Cyrodiil style in Cyrodiil. No duplicates. This mod adds conditions to 24 vanilla crafting recipes and 31 Beyond Skyrim: Bruma recipes. The method, which I am very proud of, that took me longer to figure out than I am comfortable sharing, intelligently determines whether you are in Cyrodiil or Skyrim, filtering out duplicate recipes of the other province. 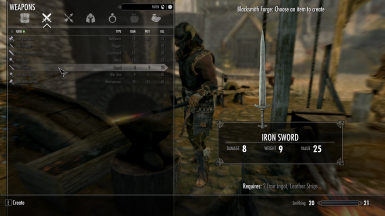 This means that, of the duplicate weapons/armors, you will only see the option to craft the vanilla sword when in Skyrim, and reversely you will only see Bruma's rendition in Cyrodiil. 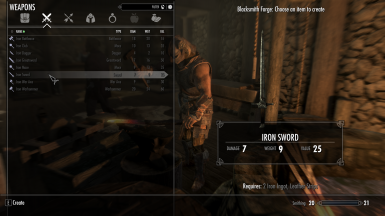 This is useful because you look through less stuff trying to find what you want to craft, it makes the cool weapons and armors of Beyond Skyrim: Bruma feel more exclusive and cool, and it makes it feel like your player character has different inspirations on the styles of their crafts based on their surroundings. You can still temper things anywhere. Because of the method, it's so smart it should work even with wacky modded ways of accessing the forge menu. Portable crafting or place-able crafting should work as intended. Flagged as an ESL, so it doesn't consume an esp slot.